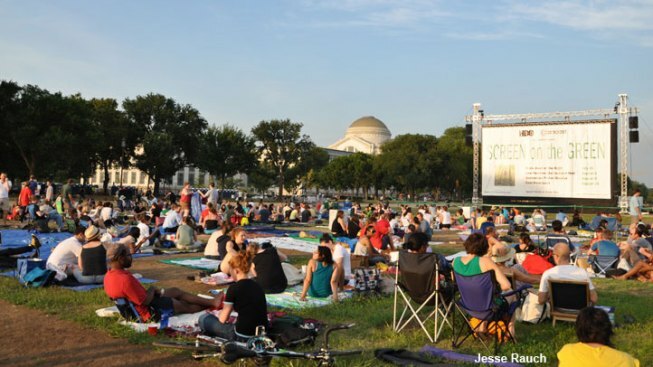 When did the D.C. metro area become a mecca for outdoor summer movies? We're not entirely sure, but do not argue with it. It is a thing, and it is awesome. From Alexandria to U Street to Rockville, you would be hard-pressed to find a place without an outdoor movie lineup. No matter where you live, you can spend your evenings watching superheroes fighting, high school kids brooding, Russell Crowe singing, or just about any contemporary and classic film your heart desires. Read on to find out how (and where) to get your outdoor movie fix this summer. NOTE: Film schedules are subject to change. Please check with the venue to verify dates and times. Black August Summer Movie Series – All movies begin at 7:30 p.m.
Golden Triangle: Golden Cinema Series – Heurich House Museum courtyard, 1307 New Hampshire Avenue NW. Fridays, June 7-July 12. Gates open at 8 p.m.
Family Night at Sursum Corda – Loree Grand Field, 2nd and L streets NE. Four Tuesdays this summer. Jane Austen Outdoor Film Series – Dumbarton House, Georgetown, 2715 Q St. NW. Sunset. NoMa Summer Screen – Loree Grand Field, 2nd and L streets NE. Wednesdays, May 22-Aug. 21. People start gathering at 7 p.m. for music, giveaways, food trucks, and other activities before the movies. Screen on the Green – National Mall, Constitution Avenue between 7th and 12th streets NW. Mondays beginning at dusk. July 22: "E.T. the Extra-Terrestrial"
Aug. 5: "Willy Wonka & the Chocolate Factory"
U Street Movie Series: Harrison Field Under the Stars – Harrison Recreation Center field, V Street NW between 13th and 14th. June 19: "Star Wars Uncut"
July 17: "The Nine Lives of Marion Barry"
Sept. 18: "The Legend of Cool 'Disco' Dan"
Bethesda Outdoor Movies– Woodmont Triangle, corner of Norfolk and Auburn Avenues, Bethesda. July 23-27, 9 p.m.
Columbia’s Lakefront Summer Festival – Columbia Lakefront Stage, 10275 Wincopin Circle, Columbia. Runs Fridays, June 15-Sept. 14 and includes concerts and dance lessons. Movies begin at dusk. Movie schedule TBA; all movies expected to be rated G.
National Harbor Movies on the Potomac – National Harbor. Sundays, May 26-Sept. 1. Includes Animation Fascination (May 26-June 30), '80s Classics (July 7-July 28) and Silver Screen Sports (Aug. 4-Sept. 1). All movies start approximately 20 minutes after sunset. June 30: “Rise of the Guardians"
Rockville Town Square: Movies on the Square – Wednesdays, June 12-Aug. 21. Cinema Del Ray – Mount Vernon Recreation Center, 2017 Belle View Blvd., Alexandria. Third Thursdays in summer; dusk. Crystal Screen: Blockbusters – Crystal City, 1851 S. Bell St., Arlington. Mondays, June 3-Aug. 26. After sunset. Mosaic District: Films in the Park – Strawberry Park, 2910 District Ave., Fairfax. Fridays, May 3-Aug. 30 at 7 p.m.
Movies Under the Stars – Pinn Community Center, 10255 Zion Drive, Fairfax. 8 p.m.
Rosslyn Summer School – Gateway Park, 1300 Lee Highway, Arlington. Fridays, May 17-Aug. 30; dusk. Starlight Cinema Centreville – 5875 Trinity Parkway, Centreville. Sundays, Aug. 3-24. Gates open at 6 p.m.; movies start at dark.